Rod cases are nice to have, but very few of the Japanese rods come with cases. The Shimano Pack Tenkara comes with a case - but it is heavy enough that a backpacker would want to leave it home. The Tenryu TF39 Becchou comes with a case, but it is an almost $800 rod. I had chosen not to carry any rod cases until I saw the ones that are frequently featured on the YoshidaKebari blog. At the time, Yoshida san used Shimano Kozuka rods when fishing in the Okutama "swamp," carrying them in plastic cases which looked like a very nice solution. It took a while, but I was finally able to track them down. Unlike the Shimano case, they are very light weight, and unlike the Tenryu rod, they are very inexpensive. It turns out that they are really pretty nice. They come in two pieces (three, counting the cap). By twisting the two pieces (essentially screwing one into the other), the cases can be adjusted for length. I've chosen to carry three sizes of the cases. The smallest fits the Shimotsuke Kiyotaki, Suntech Genryuko, Daiwa Keiryu-X, Tenryu TF39TA and Nissin Tanago Gokoro. 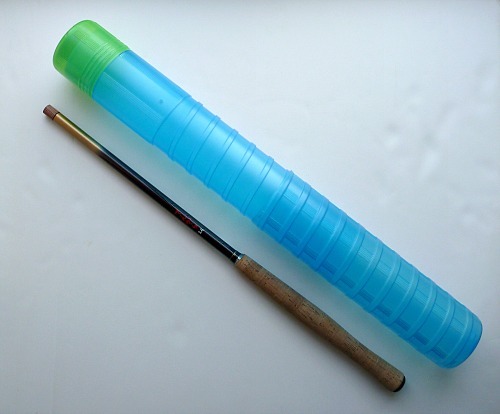 It does not fit any other tenkara or keiryu rods. When screwed to its shortest possible length, it also fits the Nissin and Daiwa tanago rods. It will fit the Nissin Pocket Mini, but it will not fit the Pocket Mini with EZ Keepers (unless you rig the EZ Keepers backwards, which some people do anyway). 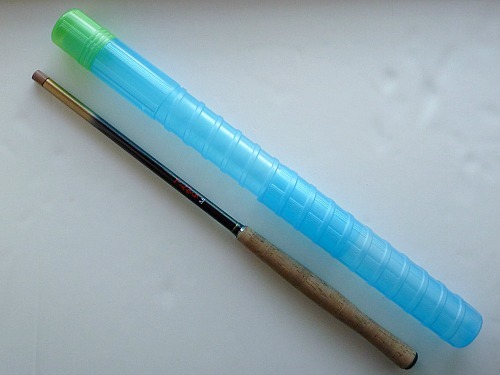 The medium one fits most tenkara rods and actually will fit two at a time - one grip first and the other tip first. It will also fit the Daiwa Kiyose 43MF and Nissin 450ZX keiryu rods, as well as all the seiryu rods other than the GMR Special 36NP. The large one might better be called a "guide" model in that it will fit 6 tenkara rods, three tip first and three grip first. One nice thing about all of the cases is that there are a couple holes in the side a few inches below the cap (visible in the photos of the small case), which allow you to tie a cord loop to the case. With the loop you can tie the case to your backpack or even make a belt loop that would allow you to carry a second rod if you didn't have a backpack or Ebira. The holes do provide a bit of ventilation, but please, do not put a wet rod in the case and then put it away. It's OK to take a wet rod home in the case, but then take it out, take it apart and allow it to dry thoroughly. Another nice thing about the cases is that they are much lighter than the hard cases most tenkara anglers are familiar with, so you could take one with you while backpacking for greater rod protection without having to worry nearly as much about the extra weight. For carrying a second rod, the Ebira is a much nicer solution, but these cases provide more protection and are less expensive. These cases aren't fancy, but they are functional. Thank you Yoshida san. Please check the collapsed length of the rod for which you are getting the case to make sure it will fit! 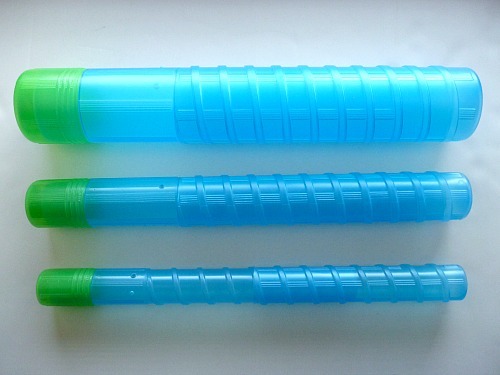 The Small case has a diameter of 1 1/8" and extends from 12" to 18" and weighs 1.3 ounces. Please note: THE SMALL CASE IS ONLY FOR THE GENRYUKO, TANAGO KORO, KIYOTAKI, KEIRYU-X, POCKET MINI, SASUKE and TF39TA RODS. IT WILL NOT FIT ANY OTHER ROD. The Medium case has a diameter of 1 1/2" and extends from 16" to just over 24". The case will not fit the Shimano 34-38 ZL or the Ito. It weighs 2.3 ounces. The Large case has a diameter of 2 3/8" and extends from 16 1/4" to just over 24" and weighs 5.0 ounces. The same company also makes a long rod case, which has the same diameter as the medium case, but can extend from 32" to 40". It will thus fit rods whose collapsed length is too long for the medium case: Daiwa Expert L LL36 and LL45M, Ito, Shimano 34-38ZL, Shimano 40-45ZE and Suntech GMR Special. It weighs 4.2 oz.